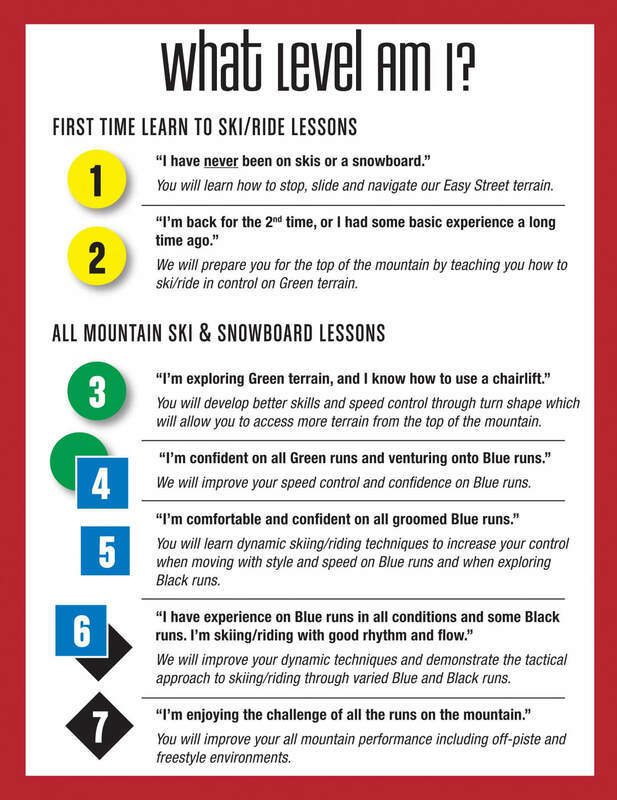 Private lessons are a great way to get started on the slopes or to elevate your skiing and riding to the next level. With one-on-one or small group instruction, a student can often progress his/her abilities more in one lesson than in an entire season without professional instruction. Sierra caters to all levels of skiers and riders by pairing up the appropriate instructor for each ability and age. Choose from 2 hours, 3 hours or a full day of one-on-one instruction to help improve your ability. This individualized experience provides instant feedback and personal attention helping you fine tune your technique while enjoying a day out on the mountain. *Please note a reservation request and private lessons are subject to instructor availability. Forms must be submitted 48 hours in advance. You can have up to 5 people at normal rate. After the 5th person, it is $75 additional per person, per lesson. All prices subject to change. Private lessons do not include lift tickets or equipment rentals. *Please note a reservation request and private lessons are subject to instructor availability. Forms must be submitted 48 hours in advance. Those who take advantage of the Early Bird Special can enjoy a private lesson on freshly groomed slopes with no crowds and receive a great deal. Lesson Start Times: Non-Peak Days start at 9:00am. Weekend & Peak Days start at 8:30am. All prices subject to change. Private lessons do not include lift tickets or equipment rentals. *Please note a reservation request and private lessons are subject to instructor availability. Forms must be submitted 48 hours in advance. Sierra At Tahoe is proud to offer adaptive lessons for both physical and intellectual disabilities. We have certified instructors in both children and adult lessons. We have limited adaptive equipment. If interested in a season adaptive pass, please complete the following form, located here and then contact our Lessons department by emailing us here or calling us at 530-659-7453 x183 for more information. *Please note this is only a reservation request and lessons are subject to instructor availability. Your lesson will be confirmed via email or phone. Forms must be submitted 48 hours in advance. Or please call 530-659-7453 x183 for more information. Please note that lessons are subject to selling out. We strongly recommended you make them at least 48 hours prior to your arrival. We recommend you arrive one hour before your lesson time to allow for ample time for the check-in and rental process. (1) For single day Cancellations made before 7am the day prior to your reservation: No charge. (2) Cancellations made between 7am the day prior and 7am the day of your reservation: $40.00 cancellation charge. (3) No Call/No Show or cancelling after 7am the day of the reservation: CHARGED FULL PRICE.